I first came across Danish artist Nicolai Aaroe when I reviewed some of his decks of playing cards that were produced by Ukrainian company Noir Arts. Nicolai comes from Denmark and has produced a three volume set of dark art decks entitled "Light Versus Darkness". Dark art is a style of art in which the artist conveys his thoughts in a mysterious style that at times draws on related genres like Gothic, surreal, and even horror. It can include attempting to depict somewhat morbid, disturbing, and nightmarish subject matter in a fascinating and beautiful way. As part of this series were his Indictus decks, Dominus decks, and Culminus decks. I'm not personally a huge fan of the dark art style, but I can appreciate Nicolai's artistic talents. 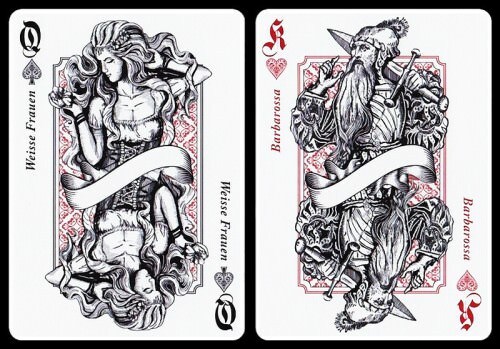 He has also applied his creative gifts to other projects, such as the Midgard decks, which is a matching pair of decks inspired by Norse mythology, and looks absolutely stunning. A set of two Ragnarok decks is currently in production, and also looks fantastic. 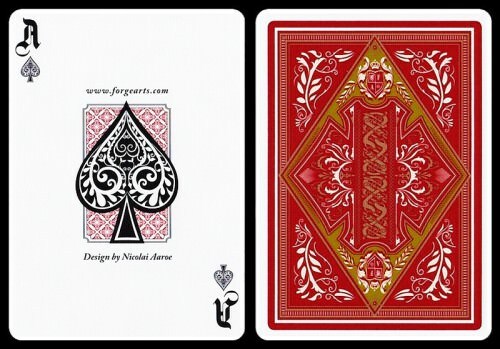 See my review of Nicolae Aaroe's decks from Noir Arts here. Given this background, it's no surprise that Nicolai Aaroe was an ideal candidate to produce another deck of mythology and culture, this time from Germany. And that's what the Marchen Playing Cards are all about. Märchen is a German word referring to fairy tales, and is the German diminutive of an obsolete German word Mär meaning "news, tale". The word Märchen thus has been defined as "a type of short story that typically features folkloric characters, such as fairies, goblins, elves, trolls, dwarves, giants or gnomes, and usually magic or enchantments." These peasant stories typically feature characters like clever children and evil kings, mysterious maidens and vengeful monsters. This is a two deck set that brings the heroes and beasts of German legends like these to life, with both decks having the goal of bringing to life elements of German culture and legends, including things like the cuckoo clock and the story-tellers Brothers Grimm. On this occasion, Nicolai has partnered with Forge Arts to produce these decks. This recent release is now available from online retailers, and is the subject of this review. 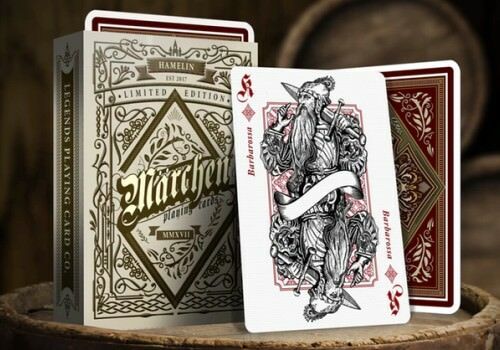 The Marchen decks consist of a pair of two decks, the first of these being the Marchen deck (Schwarzwald Edition). This green Schwarzwald deck represents the wilderness, a shadowy world of magic and wonder, while the cream Hamelin deck represents the town. "This dark green tuck box stands for Germany’s enchanted forests, home to wolves and devils, ghostly maidens and slumbering heroes, hidden caves and long-forgotten treasures. Even by day you are warned not to venture too deep into the beech and thick pine, lest you never find your way to the safety of the road again. But only the most reckless venture into the forest at night, for there witches and demons mete out fates far worse than a simple death." 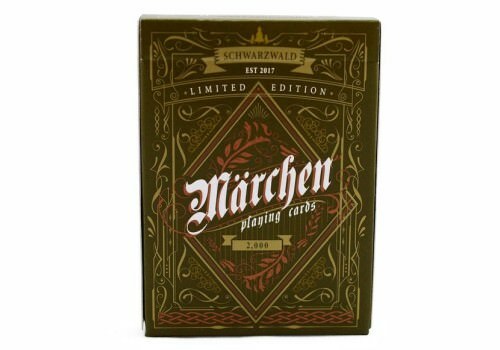 The tuck box of the the Schwarzwald deck makes an immediate positive impression with an unusual green that brings to mind the colour of moss and other forest plants. It is beautifully embossed, and comes with a custom seal that is individually numbered, this being a limited edition of only 2000 decks. The box is also finished off with full interior printing. The card backs are very practical, with a straight forward design that includes rich detail and colours that match the overall theme of the deck. 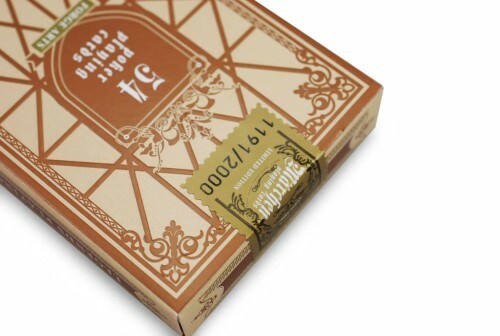 In the case of the Schwarzwald deck, dark brown has been chosen as the main colour, "evoking the mighty oaks of the ancient forest." There's lots of style present in the design, with ornate scroll-work and leafy shapes, along with a heraldic crest at the top and bottom of a crisp diamond. The Aces have giant oversized pips, touched with metallic gold ink, which is also used for the number cards. I like the fact that the name of each character has also been added to the card, making it easier to identify and appreciate. 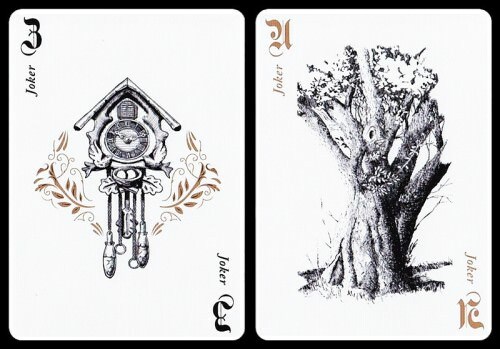 The Jokers in this deck are the cuckoo clock and the twisted tree, both of which have special significance in German culture and history. The cards have been printed with an air cushion style embossing, using the Diamond Finish from Legends Playing Card Company. 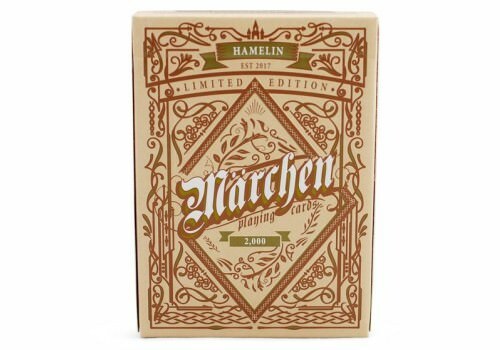 The Marchen deck (Hamelin Edition) has a beautiful tuck box like the Schwarzwald edition, but instead of a moss green colour it features a gorgeous cream. "This cream-colored tuck box represents Germany’s majestic castles, towns, and villages. From the mightiest keep to the lowliest inn, they serve as centers of civilization and culture, safe havens from the terrors of the forest. But even here you may round a corner and suddenly hear the distant song of Lorelei or the haunting pipes of the Pied Piper, tugging you back toward the wilderness, back into the shadows." Like its companion, it has an individually numbered seal, and full interior printing. For the Hamelin deck, the dark brown of the Schwarzwald card backs has been replaced with beautiful red and gold colours, "reflecting the warm glow of the hearth after a long and weary journey." 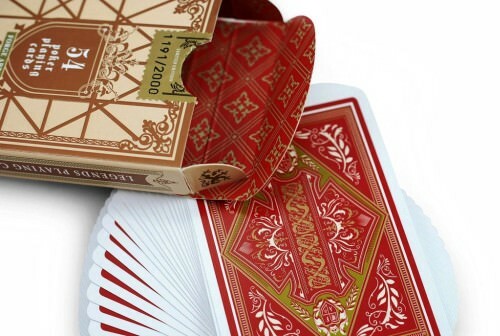 The same court card characters are used as the Schwarzwald deck, but the Hamelin edition adds a red background to give a different look to the cards, and red is used instead of gold for the diamonds and hearts. 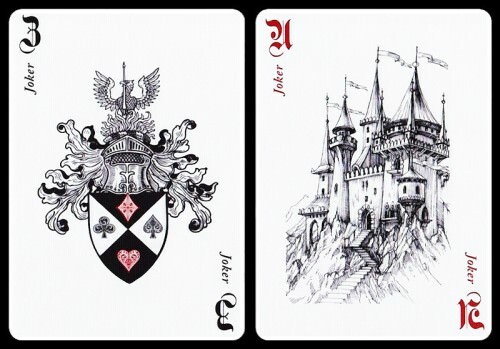 The Jokers for the Hamelin deck are different than the Schwarzwald ones, and feature a medieval crest on one, and a majestic castle on the other. Just as with the companion deck, the cards have been printed by LPCC. 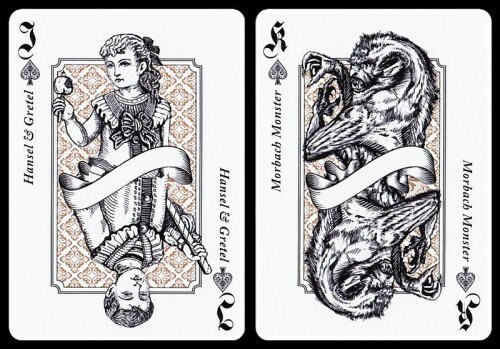 Along with the original project on Kickstarter, several extras were created which are still available separately when purchasing these decks from Rare Playing Cards. 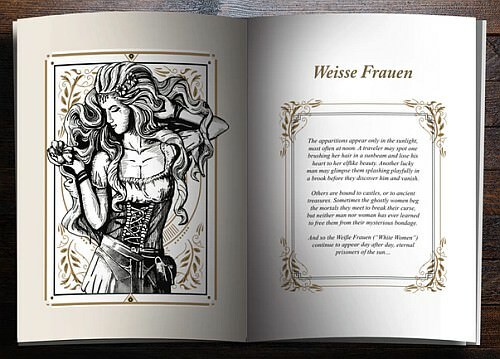 The Marchen Booklet was an optional add on that gives background information about the cards and the legends they depict, including detailed illustrations of each court card character, and information about each of their legends. An additional extra that was created to go along with the decks is a beautiful Marchen Dealer Coin. I have one of these dealer coins, and they can be handy for card games as a visual reminder on the table that designates which player is the dealer. The antique gold look it uses is just stunning. 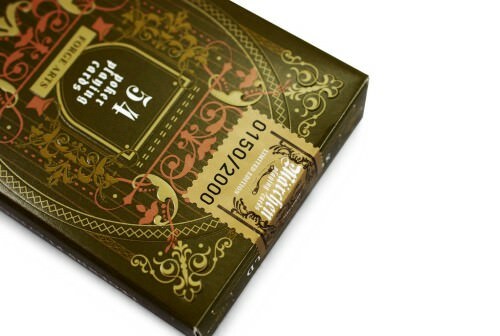 It features exquisite scrollwork that is reminiscent of some of the detail on the card backs, while the front pictures a coat of arms and says Marchen Playing Cards along with the producer Forge Arts. The other decks in my collection by Nicolai Aaroe were produced in the Ukraine by Noir Arts, and while these have exquisite tuck boxes, the quality of the cards themselves doesn't quite live up to the high standards that people today expect from a deck of custom playing cards. The Marchen Playing Cards have been produced in Taiwan by Legends Playing Card Company, and the improved quality is immediately evident. The tuck boxes are beautiful as always, but more importantly, the cards handle much better. They have been printed using LPCC's Diamond Finish, which is an extremely durable finish with a lovely snap, and also has an air cushion style embossing that ensures that fans and spreads are super smooth. 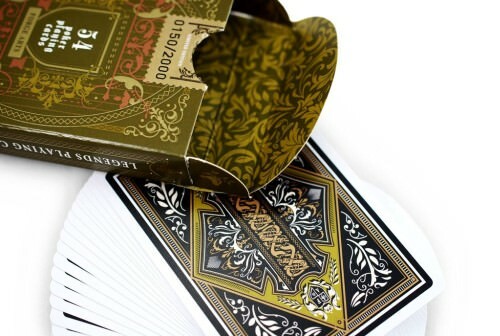 These decks are beautiful inside and out, and the use of metallic ink on the tuck boxes and the cards themselves all produces a look of sophistication and style, which is appropriate given the high quality artwork, design, and love that has been poured into these decks. These decks have rightly been applauded by consumers who speak highly of the designs and artworks, and all the feedback I've seen has been consistently positively. 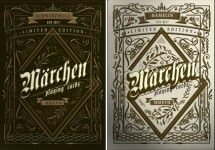 The designs will appeal to any one with an interest in German culture and history, but anyone with an appreciate of fine art can enjoy these lovely decks. 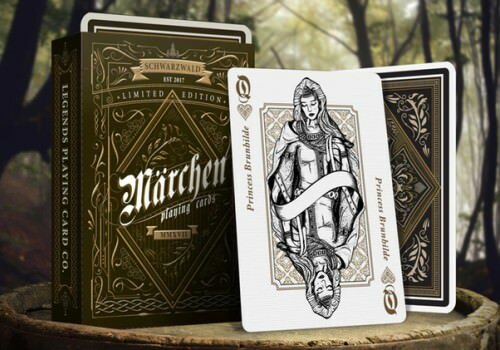 If you enjoy custom playing cards that have a genuinely original look, fine artwork, and have an appreciation for European legend, you are certain to enjoy this lovely pair of Marchen decks! What to learn more? 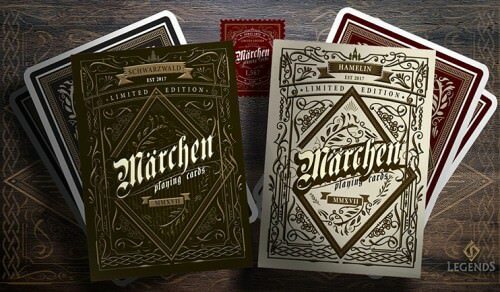 Check out Rare Playing Cards for the Marchen decks.